Via Mashable yesterday: “Global warming may have led to the death of this polar bear, researcher says” Note this is about a death that occurred last year (2014), but Mashable author Andrew Freedman implies it happened this year. 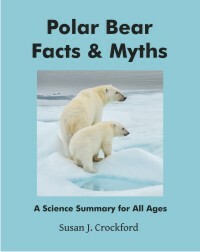 The polar bear death occurred last year in Svalbard in the Barents Sea after a fall (2013) and winter (2014) of poor ice conditions due to well-known cyclical sea ice and weather patterns (not global warming). There is no doubt that 2014 was an unusually bad year for sea ice around Svalbard during the fall and winter. This year, however, conditions improved markedly: Norwegian researchers earlier this year reported a good crop of females with cubs this spring, many more than last year (see previous post “Many polar bears cubs seen in Svalbard this year, says Norwegian biologist”). The photo above was taken by National Geographic photographer Paul Nicklan, who sent the instagram on 6 September 2015, with a photo and comments about a trip he’d taken to Svalbard in 2014. Yet the Mashable article says the photo was taken “in recent days” and includes some quotes from Ian Stirling suggesting that the death relates to low summer sea ice and makes no mention of the fact that condition this year were excellent from fall 2014 through at least early July 2015 (see sea ice map below). I guess if sea ice won’t cooperate and cause polar bears to die this year, it’s OK to use last years’ deaths instead and imply this year was just as bad. 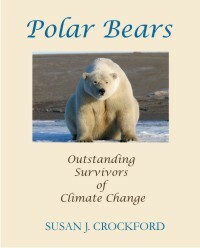 Oh, and none of them mention that starvation is the leading cause of death for all polar bears and always has been. Freedman’s update, especially the second sentence, is clearly a response to this post. The implication is that any amount of late summer sea ice that’s below average around Svalbard is a threat to polar bear survival. However, there is no published scientific evidence to support that. The evidence that links sea ice levels with polar bear body condition for Svalbard area bears is for spring and early summer ice, and for denning success, fall ice arrival dates. Many Barents Sea bears never come to land, they travel with the sea ice as it expands and contracts, and females den on the ice. 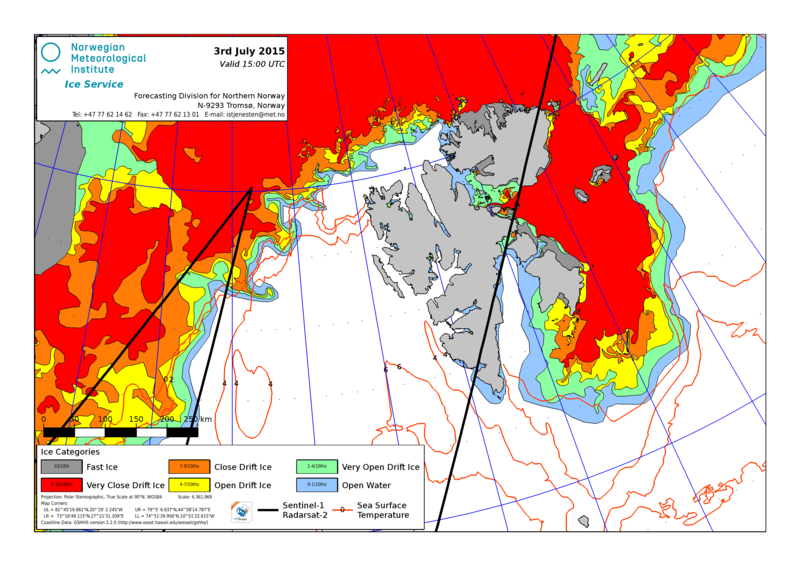 Low ice levels in western Svalbard in late summer are of little consequence for the polar bear population there. Sea ice in the Barents Sea varies with the state of the Atlantic Multidecadal Oscillation (AMO) — even the US National Snow and Ice Data Center says so. Those changes are not evidence of global warming. 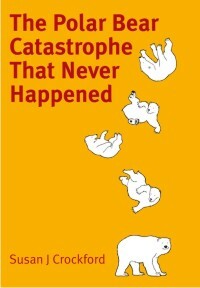 And I reiterate: starvation is the leading cause of death for polar bears. “National Geographic photographer Paul Nicklen captured a photo of an emaciated, deceased polar bear in recent days while traveling around Svalbard, Norway. This photograph, along with another photo of an exceptionally skinny polar bear that went viral in late August, would seem to speak to the dangers that global warming poses to the iconic species. Nicklen’s photo, Stirling says, shows a bear that most likely, but not certainly, died as a result of starvation related to sea ice melt. “You can’t say 100% that it starved to death, but that’s probably what happened,” he said. “It certainly looks to me like it has starved to death,” Stirling added. He said the absence of biological tests to determine if the bear suffered from a disease that could have been fatal is a source of uncertainty in this case. 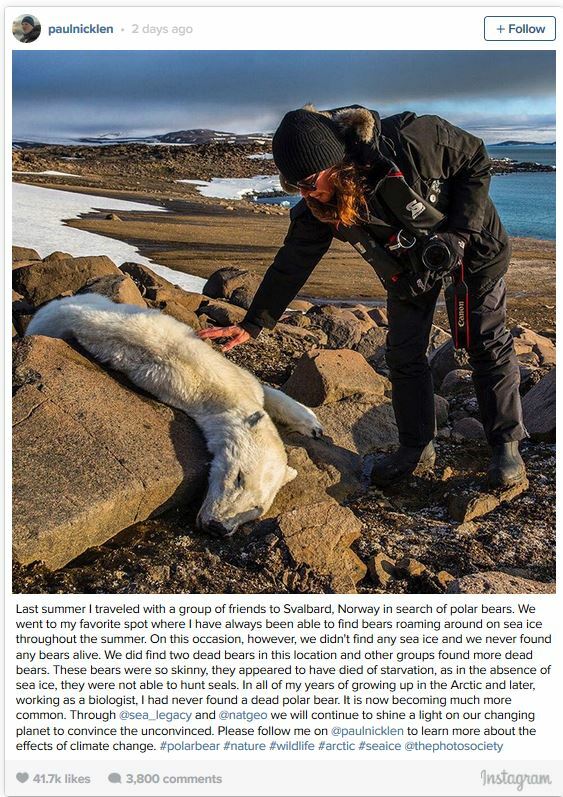 “However, the image that made the rounds in late August, which was also taken in Svalbard, provides a cautionary tale against jumping to conclusions about polar bear deaths. The photo, which was taken by wildlife photographer Kerstin Langenberger and posted on Facebook, shows a living but skinny bear walking on a small chunk of ice. This bear’s weakened condition was not likely the result of climate change, Stirling said. “You have to be a little bit careful about drawing conclusions immediately,” Stirling said. “[The bear] may be starving, but it may just be old,” he says, adding: “A difficulty hunting could be involved.” Stirling noted that the bear appears to have an injury to one of its hind legs, which could have played a role in its weight loss. This entry was posted in Advocacy, Sea ice habitat and tagged dead, global warming, Kerstin Langenberger, Paul Nicklen, photographers, polar bear, sea ice, starving, Stirling, Svalbard. Bookmark the permalink.